Children start to learn about the world around them from the moment they are born. The care and education offered by DPS Kidszone Bhopal ensures holistic development of your child with interesting activities that are appropriate for their age and the stage of development. DPS Kidszone Bhopal provides an environment where children experience the joy of learning, with the excitement of discovery through an integrated and dynamic curriculum. Our curriculum is child centered and teacher guided. We believe in providing experiences that meet the emotional and developmental needs of all children. child. To protect learning from boredom and make teaching more effective, the entire syllabus is divided theme wise. At DPS Kidszone Bhopal, we strive religiously to keep the curiosity alive in the kids. Our assessment and evaluation methods are formative and motivational. We assess children on the basis of Comprehensive Constant Evaluation (CCE), which ascertains the holistic development of your child. Children become confident with self-esteem and are able to form good relationships with the peer group as well as adults. They learn how to work independently and as a part of a group with their experience in being able to concentrate and persevere in their learning and to seek help where needed. They are eager to become knowledge explorers and show ability to initiate new ideas and to solve simple practical problems. They demonstrate independence in dressing, personal hygiene and selecting an activity or resources. They express their feelings and behave in appropriate ways with an understanding of what is right, what is wrong and why. They develop respect for cultural beliefs of their own and also of others. Children move confidently and imaginatively with increasing control and co-ordination. They use a range of small and large balancing and climbing equipments to remain fit. Kids also learn to safely handle appropriate tools, objects, construction and malleable materials with increasing control. Children are made aware of healthy living and are able to independently manage self-care. 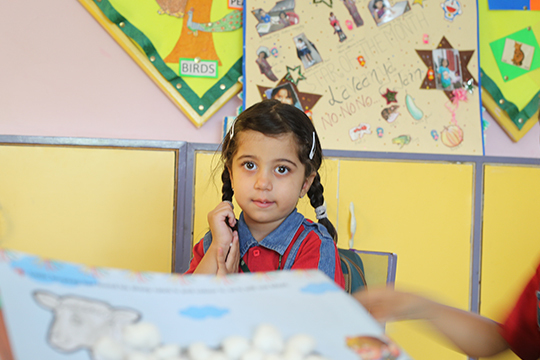 In small groups children listen attentively and talk about their experiences. They pay attention and are able to communicate with other children and adults. Kids develop a rich vocabulary and also learn to speak fluent English. They listen and respond to stories, songs, nursery rhymes and poems. Children enjoy books from our well stocked book corner and handle them carefully. The perfect blend of academics and co-scholastic activities like dance, music, Shakespeare club, PE class, yoga and aerobics makes DPS Kidszone Bhopal a unique learning destination. With a special emphasis on development of intra personal and communication skills, Circle time activities are planned for children. Many competitions, field trips and nature walks are planned across a year for children to foster their development in different domains and also to develop a sense of accomplishment.